Read carefully the bar graph below and answer the questions below. 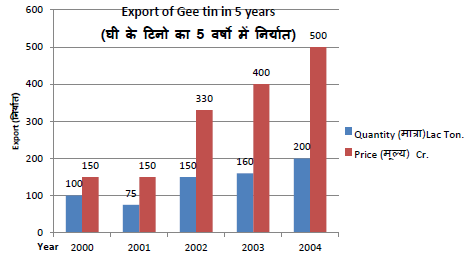 In Years 2003 and 2004, what was the difference in the number of exported Tins. How much export percentage increased From 2001 to 2005? How much percentage decreased the number of export from 2001 to 2002? In which year was the minimum price per tin? If the rate of tin was same in 2004 that was in 2003 then in 2004 what was the export value in carore ? All income groups including the organization C is the total number of individuals? 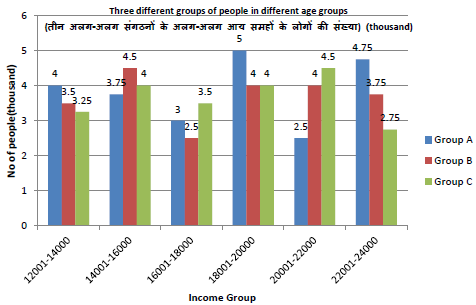 What is the maximum number of persons in the income group? Composition B of 12,001 to 14,000, from 14,001 to 16,000 and from 18,001 to 20,000 individuals in the income group of the total organization A number of individuals from the same income groups, respectively, what is the ratio? 22001- 24000 number of individuals of all income groups, income groups, what percentage approximately to the number of individuals? Organization of C income groups from 16001 to 18000 the number of people in the same income group A and B is what percentage of the number of groups? By studying the graphs below carefully answer the questions below. what was the ratio betwen the numbers of examinees in1997 and number of passed students in 2004? From the given years in which year the number of student was minimum passed? 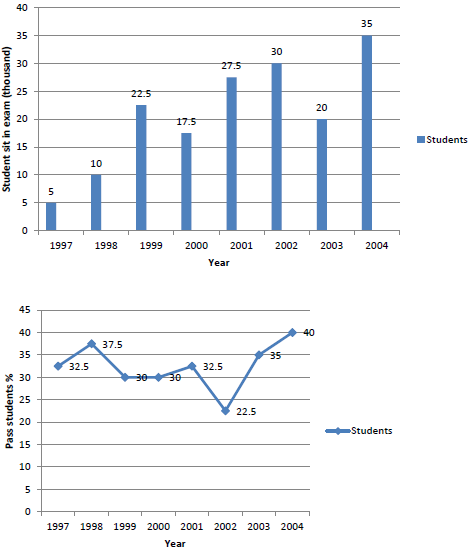 In 2002 to 2003 how much percentage decreased of examinees appeared in the examinations? How many students graduated in 2002? what was the percentage of number of students passed the examination in 1999 from number of students appeared in the examinations ? 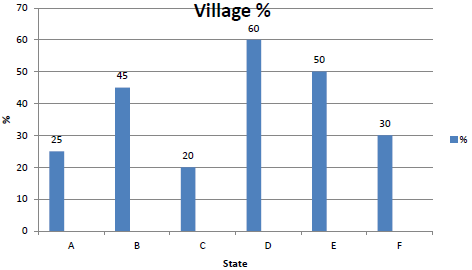 In Figure 6 below states percentage of those villages, which is not electrified. The careful study and answer the questions below? If the central government for the electrification of low electrification states starts more Electrified by giving financial assistance to States, which state will be the fourth? In the comparision of state d which state is double electrified ? In sate B how many % of villages has been electrified ? How many states 60% or more villages has been electrified? Which state has the most electrified villages?